A bright plume of exhaust roars from the end of a five-segment solid rocket booster during an Aug. 31, 2010 test of the first stage for NASA's Ares I rocket in Promontory, Utah. This story was updated at 1:03 p.m. ET. NASA test-fired a new first-stage rocket motor in the Utahdesert Tuesday for a rocket that is facing a shaky future. The space agency and contractor Alliant Techsystemstest-fired a longer version of the solid rocket boosters used to launch spaceshuttles to see how the rocket motor performs under cold-weather conditions.The rocket was laying on its side during the ground test, belching ahuge plume of exhaust into a nearby hillside at ATK's proving ground inPromontory, Utah. The five-segment rocket motor is one segment longer thanthose used for NASA shuttles. It was initially designed to serve as the firststage for NASA's planned AresI rocket to launch the Orion spacecraft, as well as part of the larger AresV heavy-lift booster. Yet those rockets, and NASA's overarching Constellationprogram to send astronauts back to the moon, will be canceled if PresidentBarack Obama's proposal for NASA under his 2011 budget request is approved byCongress. Orion space capsules are slated to serve as a rescue ship for spacestation astronauts once NASA's shuttle fleet retires next year. Lawmakers are divided over the new plan, and the futureof the Ares rockets is uncertain as various bills make their way throughCongress. For now, though, work on Constellation programs soldiers on. "This team here is focused entirely on this test,"NASA spokesperson Jennifer Morcone Stanfield of Marshall Space Flight Center inHuntsville, Ala., told SPACE.com before the rocket test firing. "This ispart of the existing Constellation program plan and that work iscontinuing." The test began at 11:26 a.m. EDT (1526 GMT), and lastedabout two minutes. Following the burn, engineers were able to take a look atthe preliminary data from the test, said Alex Priskos, first stage manager forAres Projects at Marshall, during a press conference Tuesday afternoon. The data "look absolutely excellent," he said. "We captured all the data we were after and we're looking very muchforward to being able to further assess." The motor, called DM-2, is capable of producing about 22million horsepower and generating as much as 3.6 million pounds of thrust. It is about 154 feet (nearly 47 meters) long. Even if Ares rockets aren't part of NASA's plans goingforward, the lessons learned from the test will be useful to help decide onrocket designs in the future, said Doug Cooke, NASA's associate administratorfor space exploration. "The experience gained during this test is allcontributing to our understating of what it takes to make thesedecisions," Cooke said. Today's firing was the second in a series of tests designedto make sure the rocket can function at different temperatures. An earliermotor test in September 2009 took place at ambient temperature. Today, therocket motor was cooled to 40 degrees Fahrenheit (4.4 degrees Celsius). 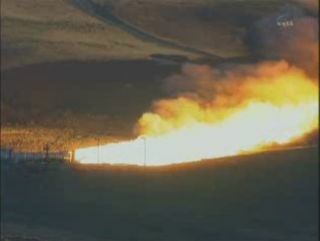 "You want to test the different temperatures becauseyou can't control the weather at the launch site," Stanfield said. "This verifies the performance requirements for the booster because solidrocket performance differs slightly in different temperatures." The design of this engine for Ares is based on the solidrocket motors that help launch the space shuttles, but with a few tweaks andimprovements. "Tests such as DM-2 allow our team to improve andenhance existing technology essential to maintaining America's preeminence inspace, even as we look to new designs, new materials and new technologies withthe potential to transform the future of human spaceflight," Andy Schorr,first stage, five-segment motor lead for Ares Projects at Marshall, said in astatement.